I recently wrote about the challenges faced by South Australia as it struggles to adjust to a renewables-heavy grid. I described the issues arising from the closure of large sources of inertia, noting that the technologies required to manage grid frequency in the absence of large units of synchronous generation such as synchronous condensers, synthetic inertia controllers and large-scale batter storage were absent from the system. Elon Musk, founder of the electric-vehicle and latterly energy storage company, Tesla, had recently made the claim that he could solve the state’s energy crisis in just 100 days through the installation of a giant battery storage facility. This promise has been called in, as Tesla has won a tender, apparently against over 90 other bidders, to build the world’s largest lithium-ion battery system – a 100 MW facility to be delivered by 1 December. The facility will be paired with a windfarm at Hornsdale, north of Adelaide, operated by French renewable energy developer, Neoen. Musk said a failure to deliver the project on time would cost his group about US$50 million, although the details of the contract have not been made public. Tesla recently completed an installation of an 20 MW grid-scale battery farm in southern California within just 90 days, which is estimated to have cost US$100 million. However, the South Australian project is five times larger than this and more than three times larger than the largest battery storage facility currently in operation. So is storage the answer? South Australia’s energy strategy calls for increasing the sources of low carbon electricity up to 100%, with an intermediate target of generating 50% of its electricity from renewable sources by 2025. In fact this interim target has already been met, with 53% of the state’s electricity coming from renewables over the past year. – South Australian Energy Minister Tom Koutsantonis. The question is whether such targets are achievable in practice. “Based on our criteria, none of the 100% renewable-electricity studies we examined provided a convincing demonstration of feasibility. Of the 24 studies we assessed, the maximum score accrued was four out of a possible seven for Mason et al. Four scenarios scored zero (i.e., they did not meet a single feasibility criterion). 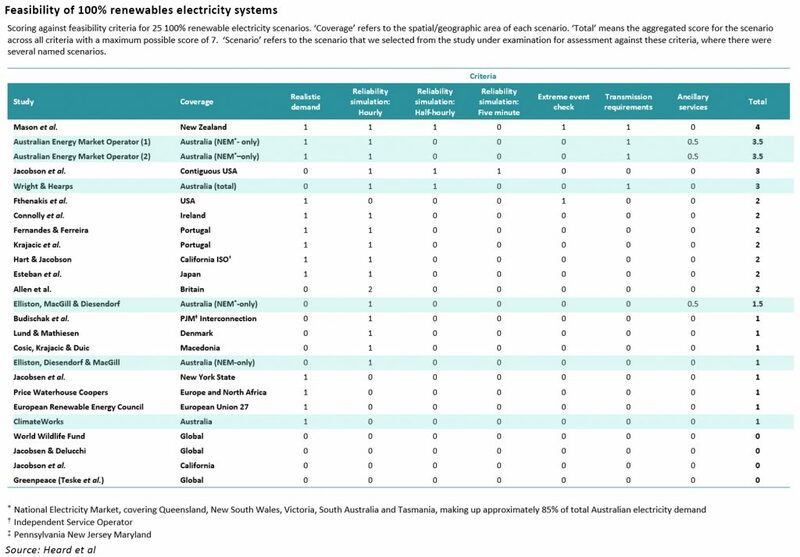 Eight of the 24 scenarios did not do any form of integrated simulation to verify the reliability of the proposed renewable electricity system. Twelve of the 24 relied on unrealistic energy-demand scenarios, either by assuming unrealistic reductions in total primary energy and/or by making assumptions of extreme increases in electrification. Only four of the studies articulated the necessary transmission requirements for the system to operate, and only two scenarios, from the same authors, partially addressed how ancillary services might be maintained in modified electricity-supply systems. This study confirms some of the wishful thinking that characterises much of the de-carbonisation agenda. Proponents of de-carbonisation recognise that current energy systems cannot deliver de-carbonisation, so they assume that technologies like storage and CCS will plug the gap, without performing any critical analysis as to whether those technologies are themselves achievable or feasibly able to deliver the required functionality. South Australia already has high levels of renewable penetration and is experiencing the expected effects on grid stability and reliability of supply. At the same time, the state has made very little progress in developing solutions to address these challenges. Storage is seen as a key part of the solution, but a big problem that is rarely addressed is the sheer size of the storage that would need to be installed to balance a large gird. The amount of storage needed would be both prohibitively expensive and take up more space than could realistically be made available. In terms of the current Tesla project, the 100 MW size, while enormous by Li-ion standards, is tiny compared with the 3.2 GW demand in South Australia, and would only have a duration of around an hour. 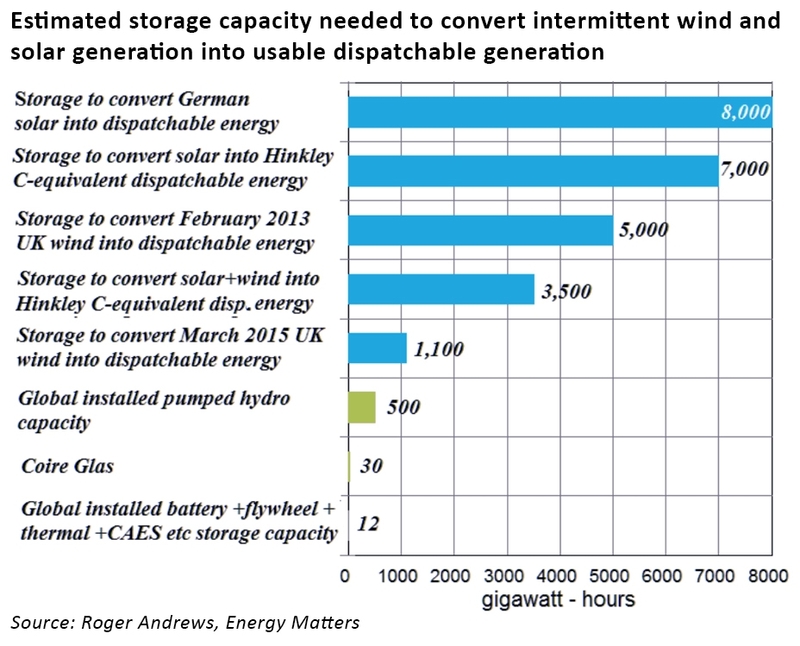 Much more storage and other approaches such as synchronous compensators would be needed….but whether there is any combination that would actually deliver a stable electricity system at high renewable penetrations seems unlikely. ← National Grid consults on ancillary services reform: will the changes go far enough? I really must object to the use of the word ‘Giant’ in the headline. By any standards Tesla’s battery pack is pathetically trivial. As you yourself confirm by reference to Roger Andrews excellent calculations. Do engineers not realise this? Of course they do, but they are no longer in control. Politicians are, and renewable energy is their virtue signalling device and batteries are the solution to renewable energy intermittency, as far as the Green Faithful are concerned. No electrical engineer who has bother to take a look believes it could ever work and it won’t. Sadly the prevalent attitude is ‘we have to conform to government policy, and its more than me jobs worth’…. You’re quite right, I should have used inverted commas round the word “giant”….by battery standards it is large, but by grid standards it’s as drop in the ocean, which is rather the point.